For those who want to become a certified arborist, the International Society of Arboriculture (ISA) Certification is a worthwhile step. to provide a means to identify professionals who have demonstrated a proficiency In the knowledge of various tree care practices. The ISA Certification Board sets criteria for who can take the exam. Those who plan to take the exam must have at least three years of full-time experience in the arboriculture field. A variety of backgrounds can be applied towards this three-year requirement including, but not limited to, tree care companies, landscape personnel, state forestry personnel, utility personnel, and pest control advisors/applicators. In some instances, volunteer work can count; however, it needs to have been supervised and documentation may be required. Those who are self-employed in a related field need to submit letters of reference along with their application. Prepare with our Certified Arborist Study Guide and Practice Questions. Print or eBook. Guaranteed to raise your score. Get started today! No one section is weighted less than 8 percent (urban forestry) of the entire exam and more than 13 percent (pruning) of the exam. The exam consists of 200 multiple-choice questions, each with four choices and one correct answer. Three and a half hours are provided to take the examination. The exam was developed by a wide variety of industry experts that collectively represent all aspects of arboriculture. New exams are created regularly, and are constantly analyzed with new questions frequently being added. Questions come from a job analysis survey taken by arborists from around the world. Certification exams are offered both at ISA chapter meetings, and exam dates are available in both the ARBORIST NEWS (a publication of the ISA) and the ISA website. Computer-based exams can be taken at Pearson Vue testing centers, which are available across the country. Certified Arborist Flashcards. 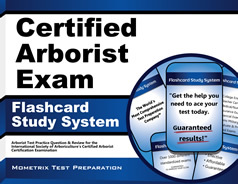 Proven Certified Arborist test flashcards raise your score on the Certified Arborist test. Guaranteed. Applications and full payment must be received by the ISA office at least 12 working days before a scheduled exam for those taking a chapter-sponsored examination. The fee for taking the exam depends on whether the test taker is a member of the ISA as well as its individual chapter (members of both receive a discount; members of just one receive a partial discount). Once an application is accepted and all appropriate fees are paid, a confirmation letter is mailed stating that the test must be taken with 90 days. Rescheduling is allowed for a $50 fee. No refunds of fees are provided under any circumstances. A score of 72 percent or above is considered passing and will lead to the designation of ISA Certified Arborist. Exams are scored electronically and score reports are mailed approximately four to six weeks following the exam. This is the only way exam results are available, and scores cannot be obtained over the phone or via fax or email. Test takers can request a re-grade of the exam for a $35 fee. For those who do not achieve a passing score, the exam can be retaken one time for free within one year of the original exam. A $100 administrative fee is charged each time the computer-based exam is taken. The designation of ISA Certified Arborist is valid for three years. Those who wish to maintain their designation must accumulate 30 or more continuing education units (CEUs) and pay a recertification fee. The ISA takes seriously any inappropriate application or examination conduct and lists a wide variety of possible inappropriate conduct on its website, including failure to disclose relevant information on an application, cheating, using copyright or legally protected material, physically disturbing the examination process, or other possible actions. When test takers apply for certification, they must acknowledge that they understand the terms of the Policy on Inappropriate Application and Examination Conduct. What is the Arborist certification? The Arborist certification exam gives arborists the necessary credentials to certify their knowledge and skills, as well as their dedication. How much does it cost to take the Arborist exam? The Arborist exam fee is $150 for ISA members and $250 for non-members. To become a certified Arborist, you must successfully complete a certification exam, which requires you to have completed at least 3 years of experience. If you hold an associate’s degree, you only need two years of experience. 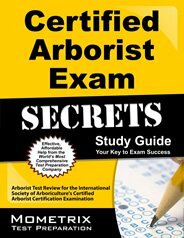 Is the Certified Arborist exam all multiple choice? Yes, the Certified Arborist exam contains 200 multiple-choice questions. How long do you have to take the Certified Arborist test? Test-takers will be given 3.5 hours to complete the exam. How do you sign up for the Certified Arborist exam? To sign up for the Certified Arborist exam, visit the ISA website. What is a passing score for the Certified Arborist exam? A score of at least 72% is considered passing for the Certified Arborist exam. How many questions are on the Certified Arborist? There are 200 questions on the Certified Arborist exam. Explore our free Certified Arborist review provided by Mometrix. Check out our premium Certified Arborist study guide to take your studying to the next level. If you benefit from these materials, just click the link below! To compliment our Arborist certification book, we also offer extensive Certified Arborist flashcards for even more Arborist certification test prep help. We hope you enjoy our products! Your purchase helps us make more great, free Arborist certification content for test-takers just like yourself.